Based on my limited experience and use, and therefore limited global knowledge of the software, I would recommend it especially if the data that will be used as inputs to the model has previously worked on a spreadsheet such as Excel.I would also recommend it to analyze problems of medium and small size. Given the experience I have had when I have used it with large problems, there have been noticeable decreases in the speed of response (which are not associated with the size of the system of equations involved in the calculation). Excellent for processing linear programming models. Without the program being "my favorite" it is necessary to recognize that handling in the Excel application environment provides it with a feature with a high added value, compared to other softwares that do not have those characteristics, which makes the handling of data from external sources is easier. In addition to its inherent quality of general data analysis, I can also highlight the areas in which I have used it (field of linear optimization, simplex method and non-linear optimization, network models) where it has allowed me to model, simulate and analyze different situations with great success. I could say that the limitations are not the program but mine as a user of it. Unlike other software that I have used (WinQsb and Lingo, for example), it presents an acceptable customer service. On the few occasions when I have used it to deal with problems of optimization of relatively large parameters (with a large number of restrictions and decision variables), the program has been slower, not substantially but slower, than programs such as the WinQsb, even when the latter runs on 32-bit machines and not 64. That has caught my attention, even though it is not a real problem for the uses I give to the program. Given my partial function as a university professor, it has been much more effective and practical to use other software, due to the limited options that the educational license associated with the software has. App Data Room has been instrumental in allowing our sale representatives to present up-to-date and innovative marketing collateral to potential customers. A second value add is that our Marketing Department is able to create and upload the most current material to the app so that our sales representatives have access to the most up-to-date information to present to our customers. Overall, the App Data Room product is easy to use. Our Marketing Department is able to quickly upload updated and new material once they create the documents. Users are able to quickly find material filed by subject matter. Once the appropriate material is located, it can be presented on their iPad and emailed to prospective customers who indicate interest in the products. The few support requests that we have submitted have been resolved within 2 business days. The App Data Room staff has also been responsive to suggestions from our staff to upgrade the product - specifically in the area of analytics. No, key insights. Implementation was easy. The App Data Room staff hosted initial training sessions for our support personnel, and then these support persons conducted training and support sessions for our users. The use of this software does not necessarily follow that it is "globally better" than others. In the department we have used this and others with similar characteristics, given that, as previously indicated, all the software has advantages and weaknesses with respect to other software with similar characteristics. Obtaining better results lies in the user's ability to detect those "benefits and weaknesses" and maximize their usefulness within the specific field of work in which they operate.In our case, one of the reasons that led us to try and use it, was related to trying to "tie" more processes to the same environment, which in this case is the one associated with the Excel database, in such a way as to reduce the initial manipulation and accommodation that should be made to the data if they come from different sources such as MATLAB, or WinQsb.This facilitates the use of software for the type of user who does not necessarily have deep knowledge of linear algebra or operations research, for example. On the contrary, the most analytical and knowledgeable user manifested in a high percentage, preferring to use MATLAB as a tool, claiming that they have a greater and easier access to the calculation functions, which even in specific cases, could be modified. We've used custom developed tools in the past but the upfront cost is very high and the solution we had was very costly to update. We did not have a CMS previously so real-time updates were unheard of. 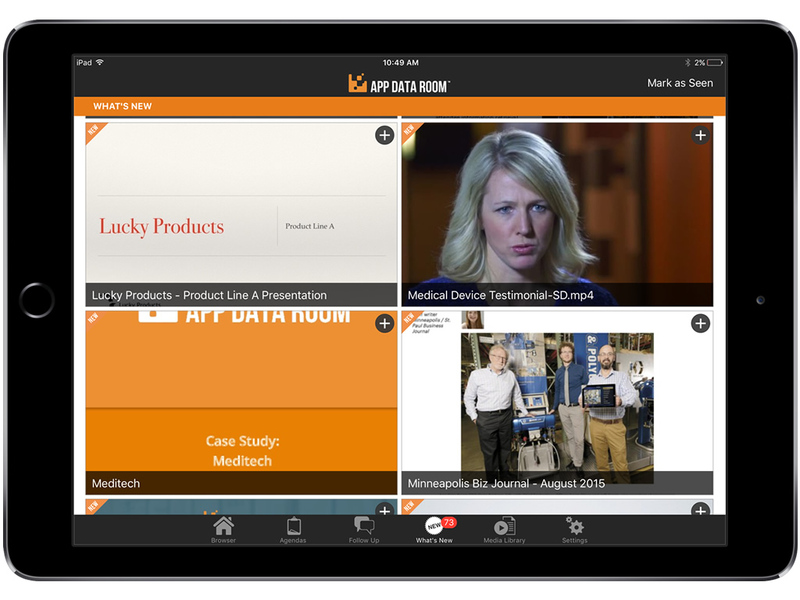 App Data Room has all of the features we previously had plus so much more. - It has allowed finding ways to optimize (minimizing costs or times) the field processes involved in various projects. It has even allowed, in specific cases where it was used for that purpose, to optimize the allocation of resources (people) to work in different jobs that present weekly variations of the activity that these people must perform. It has allowed the sensitivity analysis of projects to changes in the decision variables related to them, which, and in very dynamic and changing environments, resulted in substantial decreases in money losses. I don't have any hard numbers. But all I get are good reviews and compliments from our sales team and customers who interact with ADR.